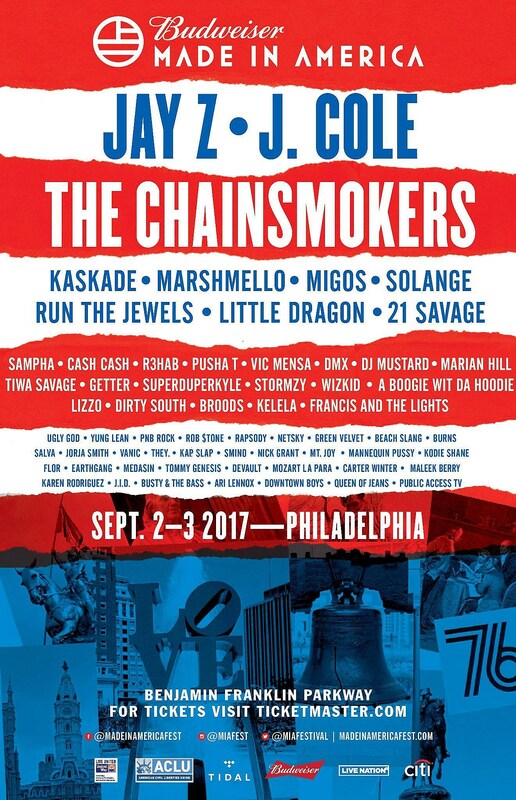 Jay Z and Budweiser‘s “Made In America” festival is returning to Philadelphia this year, and its bringing another impressive cast of artists to the Labor Day weekend festival. Headlining the festival this year will be the festival’s very own, Jay Z, and he is bringing his Roc Nation rapper J. Cole, and EDM superstar’s The Chainsmokers along for the ride. Other highlights of the lineup including names like 21 Savage, Solange, Sampha, Migos, Little Dragon, Run The Jewels, Kaskade, Vic Mensa, Pusha T, Kyle, They. and many more. Be sure to get your presale tickets now, because on September 2nd and 3rd, you wouldn’t want to be anywhere else but Phili’s Benjamin Franklin Parkway. Check out Made In America’s full lineup below!